The Most Holy Rosary of Our Lady | Cause of Our Joy! *Re-printed with permission from marianapostolate.com; Authored by Jayson M. Brunelle. Second only to the most Holy Sacrifice of the Mass, the Rosary of our Blessed Lady is, without question, the “highest” and “most exalted” form of Catholic prayer, and this due to the fact that we meditate on the central mysteries of Christ’s life, death and resurrection, through, with and in the Immaculate Heart of Mary, she who “ kept all these [mysteries], pondering them in her heart” (Lk 2:19). 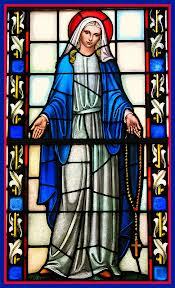 Moreover, it appears as though this exalted form of Christian prayer was prophetically announced in the Old Testament Book of Ecclesiasticus (or Sirach), Chapter 24, Verse 18, where “Created Wisdom,” a figure of the Blessed Virgin Mary, states the following of herself: “I am the mother of fair love, and fear, and knowledge, and holy hope.” This single passage certainly seems to be a most appropriate description of each of the four sets of mysteries, as the Joyful Mysteries can be characterized as expressive of the fair love of our Lord and our Lady; the Sorrowful Mysteries teach us to fear the re-crucifixion of Christ through the commission of sin; the Luminous Mysteries shed the light of knowledge on the public mysteries of Christ’s three-year ministry; and, finally, the Glorious mysteries teach us to hold onto the holy hope that this set of mysteries sets before the eyes of our soul. In each well-prayed Rosary, the Mother truly unites her most beautiful and all-powerful voice to ours, making of our prayer a truly pleasing and fragrant offering unto each of the persons of the Most Holy Trinity. In it, the Father rejoices in receiving sublime consolation from His creation through the Immaculate Heart of the Mother of His Son; the Son eagerly presses to His Most Sacred Heart all hearts that have been entrusted and offered to Him by His Most Holy Mother; the Spirit, or the Divine Advocate, is irresistibly drawn to each soul in whom His well-beloved spouse, the created Advocate – Mary – has made her dwelling. Finally, it goes without saying that our Spiritual Mother leaps with joy each and every time she is greeted, by one of her many beloved children, in the same manner that she was greeted by St. Gabriel, who, in announcing to her the exalted vocation to which she had been called by God, greeted her with that sweet “Ave.” Thus, after the supremely perfect glory and honor offered to God in the Liturgical celebration of the Holy Sacrifice of the Mass, it would not be an exaggeration to state that the Holy Trinity receives its greatest adoration, glorification, gratitude, supplication and expiation from those individuals who, through, with and in the Immaculate Heart of Mary, the masterpiece of God’s creation and the treasury of God’s greatest graces, allow themselves to be transformed ever more perfectly into Christ’s image and likeness through their meditation on the Salvific mysteries of Christ’s life, death and resurrection, as they repeat the words of the Angelic Salutation. The Rosary involves both meditative and vocal prayer, and quite often leads one into a passive state of contemplation, whereby the soul ceases to be active and rather rests in the peace, love and presence of God Himself. We must understand the distinction between meditation and contemplation. The former involves activity on our part; that is, as we meditate on any of the 20 mysteries of the Rosary, we simultaneously pray out loud to Our Lady, rendering unto her the praise and veneration that is Her due, and asking her to exercise her maternal mediation on our behalf. Contemplative prayer, on the other hand, is a free gift bestowed upon an individual who is properly disposed to receive this gift. We prepare ourselves precisely by performing the activities of both vocal and meditative prayer. Contemplation can be defined as the passive, phenomenological experience of the soul resting in the presence of God. Moreover, it should be noted that we do not pray in order to receive this free gift of contemplative prayer; God may or may not choose to impart this gift upon a soul, knowing, in His perfect Wisdom, precisely what each individual soul needs at any given time. Rather, we, having committed ourselves to the Blessed Virgin, have promised to stay united to her Most Immaculate Heart, and this is accomplished through, with and in the recitation of her prayer, the Most Holy Rosary, and active meditation on the sacred mysteries of our salvation. As we read above, countless saints, mystics and popes have hailed the Rosary of our Blessed Mother the single most salutary and efficacious of devotions after Holy Mass, and the Mother of God herself has come from heaven to reveal the treasures of grace hidden in the Rosary. In every single Church-approved apparition of Our Lady during the 20th Century, she admonishes us to pray this, her prayer. Despite what has already been stated, we might still be wondering why the Rosary, in particular, is so powerful. The answer is quite simple: not unlike our mysterious Lord, Who is, simultaneously, profoundly simple and infinitely profound, so too is the prayer of the Holy Rosary. It is so simple that the youngest of children can be taught to pray it; yet the mysteries that are meditated upon are, in all truth and without the least exaggeration, “mysteries” in the strictest sense of the word; that is, they are truths belonging to the Sacred Deposit of Faith that surpass the finite, limited human mind’s ability to grasp their full import. In truth, these mysteries are literally inexhaustible. It is precisely for this reason that such brilliant minds as those of Aquinas and John Paul II were capable of speaking of the inestimable value the repeated recitation of the ”Angelic Salutation” while meditating upon the mysteries of God’s salvific plan for humanity. As Catholic Christians, the Most Holy Rosary of Our Lady truly is among the most powerful of weapons we possess as we wage war with Satan for souls. The prayer of the Rosary can, quite literally, alter world events: it can prevent world wars, put an end to the silent holocaust of abortion, bring about the conversion of even the most hardened of sinners and enemies of Holy Mother Church, and, most importantly, hasten the promised “Triumph of the Immaculate Heart of Mary” in the world, thereby ushering in the new era, the new springtime for the Church and the world, with all of creation returning to the perfect glorification of the Lord, its creator. Moreover, the daily prayer of the Holy Rosary is absolutely integral to the living of one’s total consecration to Mary, as is the wearing of Our Lady’s religious habit or garment of the Brown Scapular (truly the “religious habit” of those souls consecrated to Our Lady and her service) for it is simultaneously the chain that (1) binds us to Mary’s Most Immaculate Heart, whose Heart beats in a perfect union of love with the Sacred Heart of Christ Jesus, her Son and her God; (2) and it is additionally the chain that shall forever bind Satan, or Lucifer, in the everlasting lake of fire, thereby preventing him from prowling throughout the world in his endless effort to bring souls created by God and for God to ultimate ruin. Thus, the Rosary can be thought of as the “key” that unlocks the door of and gains us entrance into the glorious temple and refuge of Mary’s Immaculate Heart. One who is consecrated to the Immaculate Heart of Mary should, in keeping with one’s total dedication and gift of self to Mary Immaculate through their solemn act of consecration, commit him/herself to the praying of at least five decades of the Rosary daily. Ideally, we should strive to pray an entire 15 or 20 decade Rosary daily. Finally, the Rosary holds a place of particular importance in these most difficult times through which we are living; specifically, that period of time spoken of in the last book of Sacred Scripture, the Book of Revelation. For, as the Eternal Father’s demand for Divine Justice escalates, and chastisements increase in frequency, duration and intensity, the Holy Rosary shall become our only refuge and our sole source of strength, endurance and survival. The traditional Dominican Rosary of Our Lady is composed of five sets of ten small beads, separated by 5 large beads. Each bead on the small set of 10 represents one “Hail Mary.” The “Our Father” is prayed on the large beads. 1. The Annunciation; 2. The Visitation; 3. The Nativity; 4. The Presentation of Our Lord in the Temple; 5. The Finding of Jesus in the Temple. 1. The Agony in the Garden; 2. The Scourging at the Pillar; 3. The Crowning with Thorns; 4. The Carrying of the Cross; 5. The Crucifixion. 1. The Resurrection; 2. The Ascension; 3. The Decent of the Holy Spirit at Pentecost; 4. The Assumption of Mary, Body and Soul, into Heaven; 5. The Coronation of Mary as Queen of Heaven and Earth. 1. The Baptism of Jesus; 2. The Wedding at Cana; 3. Proclaiming the Kingdom of God; 4. The Transfiguration; 5. The Eucharist. (5) Call to mind the Mystery, then on the large bead recite the Our Father. (6) On the ten small beads recite the Hail Mary while meditating on the mystery. (7) Recite the Glory Be. (9) Repeat steps 5-8 until you have completed the five decades of the Rosary.